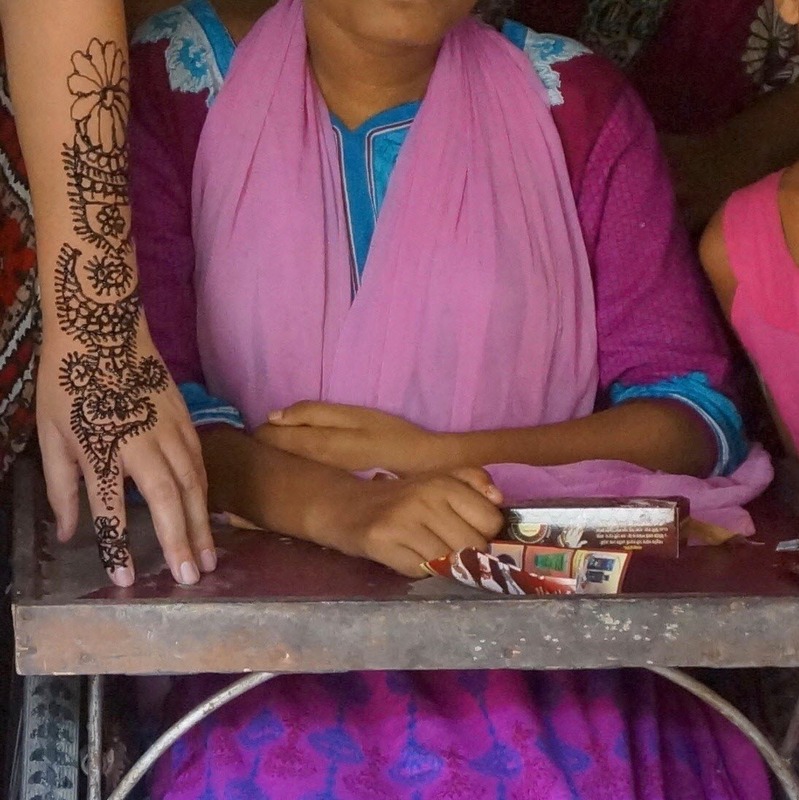 There are 12 girls in Bangladesh whom physical therapist Anna Tupetz will never forget. She went into their homes and spoke with their families. She saw how they lived: how they bathed, dressed and ate. She asked them about their hopes and dreams for a future she promised could hold meaning. Each one had survived a devastating injury; the long scarves they draped around their shoulders had gotten caught in the rotating engine of a motorized rickshaw, yanking their heads backward and breaking their necks. The girls Tupetz met had all received treatment at the Center for Rehabilitation of Paralysis (CRP), the nation’s only rehab center that focuses on spinal cord injuries. An untold number of other young victims never make it to CRP. Some die from their injuries; many others live disabled—and uncounted. But even the cases that are known point to a horrific and growing problem. 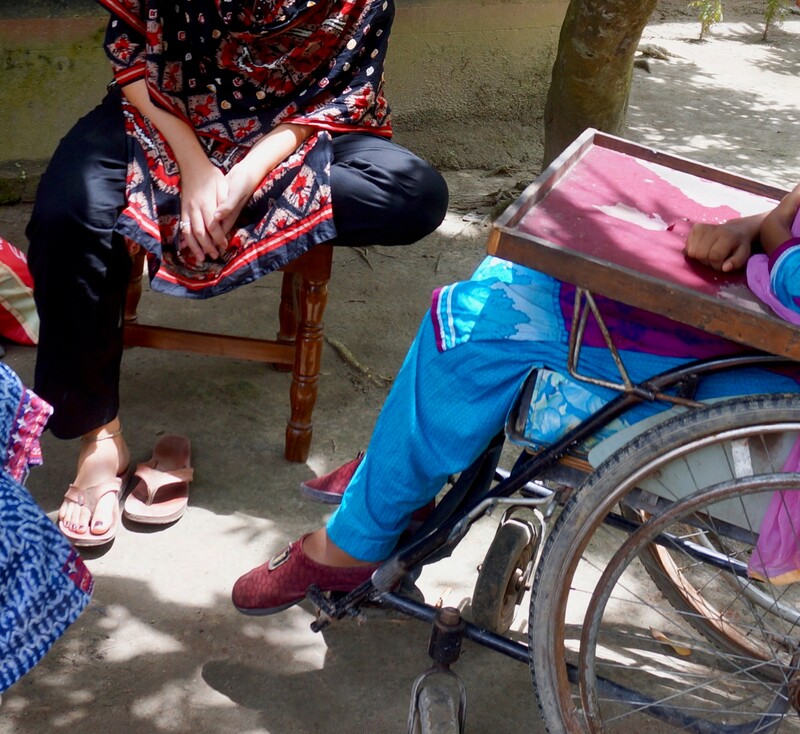 Between January 2014 and June 2018, 40 women were brought to CRP with spinal cord damage after riding in an Easy Bike, an electric rickshaw that has become a popular mode of transportation for young women going to school or to visit friends. The cheap, efficient rickshaws make sense for Bangladesh’s potholed, traffic-choked roadways. 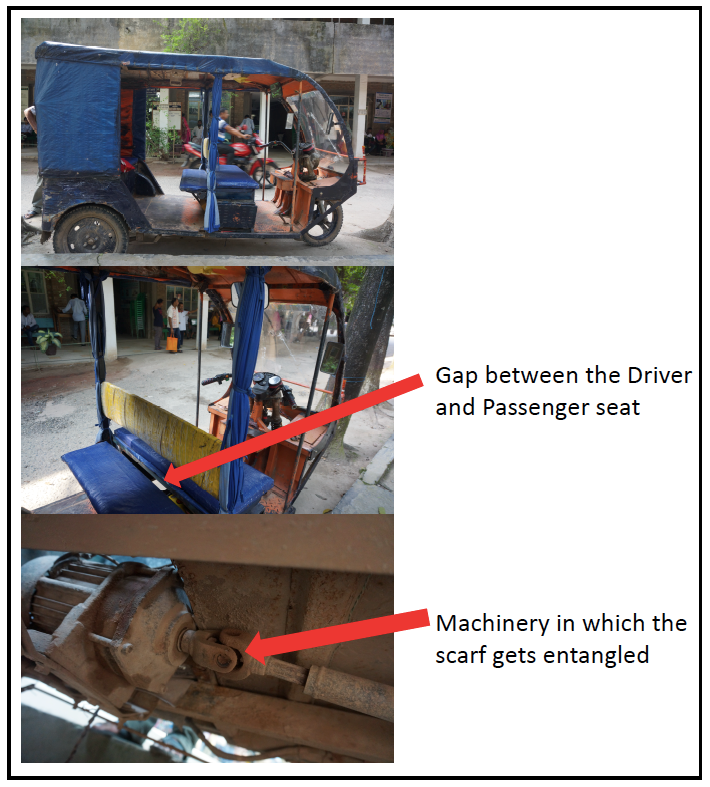 But an open shaft behind the driver allows dangling fabric to get stuck in the spinning motor, and most drivers and passengers have no idea of the risk. “It’s so forceful that you don’t see it coming,” says Tupetz, who traveled to Bangladesh to explore the nature of the injuries and how young women and their families coped. How the Easy Bike's machinery causes the strangulation. In Bangladesh, women traditionally wear an orna, or scarf, to cover their heads. But younger women and girls wear it fashionably draped around their necks. They often choose silkier fabrics that are more easily sucked into motors and, when jerked tightly, cut sharply into the skin. Finding those answers propelled Tupetz into a collaboration with CRP, and into those 12 girls’ homes for in-depth interviews about their lives following their accidents. What she heard made her realize that the problem is so much bigger than a scarf and a bike. Interview with a scarf injury patient. The complications begin at the scene of the accident, where victims are often mishandled by first responders who don’t know to stabilize the girls’ necks before moving them. That misstep can worsen their injuries and their prognoses. When survivors are taken to clinics, they are often treated by healthcare staff who have limited experience with neck fractures, and little awareness that scarf injuries can cause them. Their injuries are often misinterpreted or dismissed. One survivor was turned away by clinic staff who assumed the marks on her neck were signs of a suicide attempt. Because girls in Bangladesh are not taught to advocate for themselves, “most of them usually do not get proper care,” says Helal. As a result, scarf injury victims can go weeks or months before being referred for specialized care—if they are referred at all. Among the girls in Tupetz’s study, it took an average of 48 days and up to 215 before they received care at CRP, and some had visited six different clinics before being referred. And continuing to seek treatment requires economic sacrifices that are impossible for most families in Bangladesh. One family in Tupetz’s study paid close to $6,000 for acute care—the equivalent of four years of income for the average Bangladeshi family—even before reaching CRP. At CRP, a hospital aide carefully smooths Chapstick onto a young girl’s lips, her face permanently gazing upward toward the ceiling where a mirror has been placed so she can see her own expressions. While at the center, scarf injury survivors receive occupational and physical therapy aimed at increasing their functionality at home. They—and their caregivers—have so much to learn: how to use a catheter, avoid getting bedsores, stay clean. And how to take care of their emotional and psychosocial wellbeing, a task that isn’t easy in a country that is not set up for people living with disabilities. Tupetz visited with one 20-year-old survivor whose wheelchair could not fit into the bathroom. She had to be carried outside and bathed in public. The loss of independence and privacy had left her withdrawn, desolate and depressed. But others were part of supportive families and school communities that provided that most essential recovery tool: hope. Girls who share that belief seem to do better mentally. Tupetz spent time with one survivor who was so committed to succeeding in school that she insisted on continuing her studies during the months she spent in rehabilitation. An occupational therapist built her a special stand so she could see her textbooks while lying down. The day after her release from CRP, the girl sat for her exams and did so well she earned a merit-based scholarship. Another girl stayed focused on fulfilling her traditional role as caregiver, dedicated to one day building her mother a house and taking care of her as expected. Her school built her a special ramp so she could get to classes. “If I get educated, people will value me for my mind and my brain and I’ll be able to build that house,” she told Tupetz. Henna painted by a scarf injury patient with her mouth. 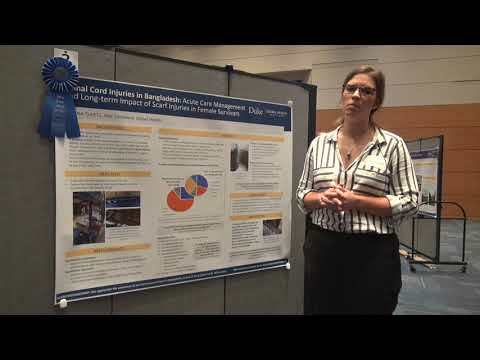 Tupetz hopes her research can be the starting point of a conversation with CRP and others about how scarf injuries can be prevented and how care for survivors could improve. “CRP is doing an incredible job and the level of healthcare they’re providing is really incredible given the resources they have available,” says Tupetz. “But it’s one center for the entire nation.” Ultimately, she believes, scarf injuries need to be addressed as systemic issue by a range of stakeholders including the government. Helal agrees. He says establishing patrol police and ambulance services, working with the government to deny road permits for Easy Bikes, and educating doctors and nurses about emergency management and patient referral following cervical cord injuries is key. But the first step is to continue raising awareness about this preventable injury. Easy Bike drivers could save lives by simply covering that shaft over the engine with a wooden block, or putting a sticker on the seat that reminds young women to wear their scarves in the front. CRP is currently building awareness through workshops in schools and colleges, and with Easy Bike drivers, owners and importers. A woman wearing the orna (scarf worn with the loose ends to the back) walks next to a row of Easy Bikes. Not all females wear the head scarf, but all wear the orna. Between January 2014 and June 2018, 40 women were brought to the Center for Rehabilitation and Paralysis with spinal cord damage after riding in an Easy Bike.